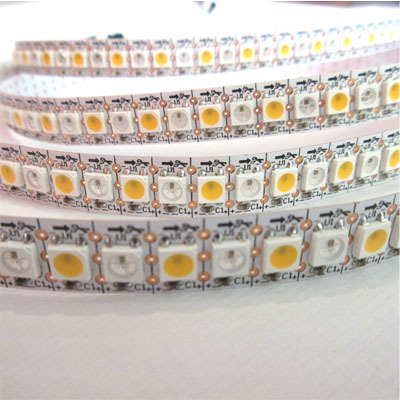 APA104 LED strip is one apa104 rgb alternate with one digital white color digital CCT dimmable strips .The White Color can be Warm White(3000±200K),Nature White(4000-4500K),White Color (6000-6500K),Cool Color (6500-7000K). 3 cables:Black :GND,Green :DATA,Red :+5V. Each led individual controlled,every led cutable. high intensity video screen,video wall,water running effect,breathing effect,color chasing,etc..